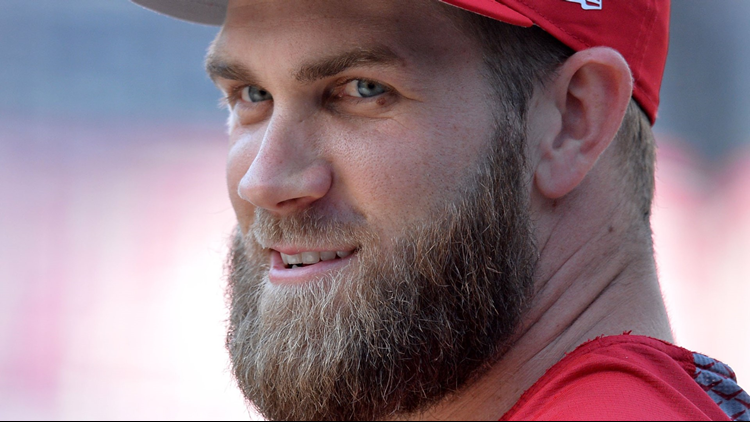 Washington Nationals right fielder Bryce Harper smiles before the game against the San Diego Padres at Petco Park on May 7, 2018. Bryce Harper's combination of skills, age and marketing cachet make him an excellent fit for any major league franchise... including the Colorado Rockies. Bludgeon the hell out of your opponents. It’s a particularly good look in Colorado, where the air is thin, the ball flies and even in a post-humidor era, you can never have enough runs. Yes, Coors Field still played as the friendliest run-scoring joint in the National League in 2018 (soon-extinct Globe Life Park in Texas was slightly better). Only Cincinnati’s Great American Ballpark rated a better home run haven, though Coors’ conditions are often favorable to lefty power hitters. 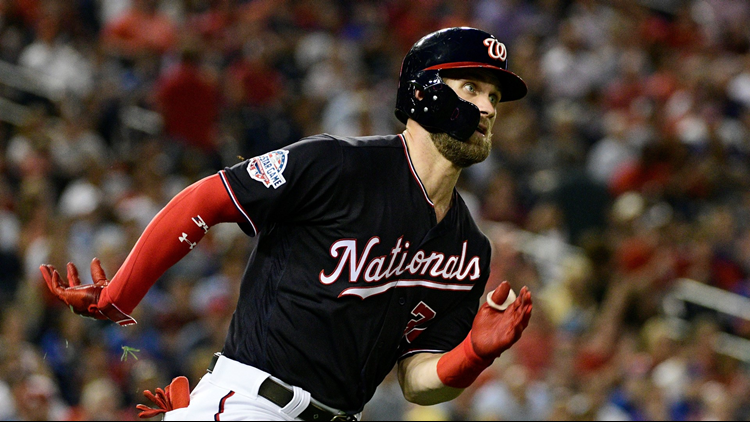 Washington Nationals right fielder Bryce Harper runs the bases on his fourth inning rbi double against the New York Mets at Nationals Park on Jul 31, 2018. So imagine, for the next five to eight to 10 years, the Rockies rolling out Harper, Charlie Blackmon, David Dahl and Ryan McMahon from the left side. Imagine, for the next three seasons, right-handed slugging shortstop Trevor Story slotting between two of the above. And imagine, perhaps for 2019 only, Nolan Arenado bunched in with that group, too. Sure, signing Harper – with Blackmon already under contract for up to five more years and at least $95 million – might preclude the Rockies from re-signing Arenado. At the same time, there’s no guarantee they can re-up their generational third baseman, anyway, and with Story, McMahon and Brendan Rodgers all under team control for three to seven seasons, the infield will be OK beyond next season. In the meantime, they can take their most meaningful crack at a World Series championship ever in 2019. Forget the magic of 2007’s Rocktober. In Kyle Freeland, 25, and German Marquez, 23, the Rockies have a 1-2 pitching duo capable of flourishing at Coors Field, with a solid quartet behind them to chew up the remaining innings. And they’d be backed by a lineup featuring two potential Hall of Famers entering their age-26 and age-28 seasons. If there’s anything baked into the Rockies’ DNA, it is this: Throwing big money at pitching rarely works, be it Darryl Kile in 1998 ($24 million, a 5.84 ERA over three seasons), Mike Hampton in 2001 ($117 million, a 5.75 ERA over two seasons) or the $106 million expended last off-season on relievers Wade Davis, Bryan Shaw and Jake McGee (who combined for a 5.41 ERA). 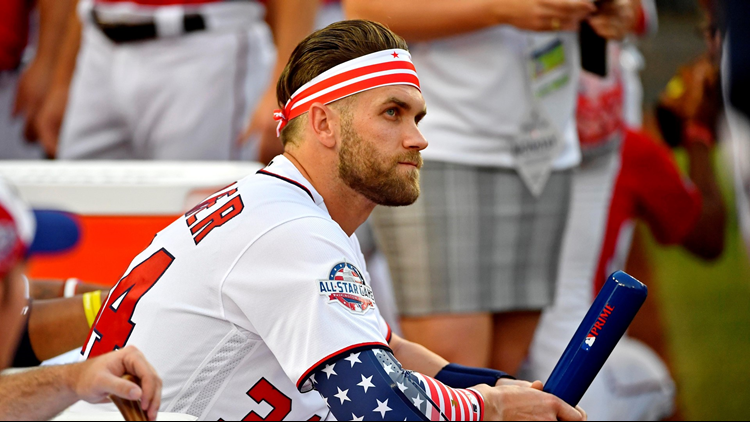 Washington Nationals right fielder Bryce Harper during the 2018 MLB home run derby at Nationals Ballpark on Jul 16, 2018. Remember the first time they lavished big money on a Hall of Fame-caliber hitter? Larry Walker’s 10 years in Denver were a revelation, featuring four All-Star appearances, one MVP award, 258 homers and a 1.044 OPS that began when he signed a four-year, $22.5 million deal as a 28-year-old in 1995. Scoff if you must that this came at pre-humidor Coors Field during the offensive environment of the so-called steroids era, but Walker’s park-adjusted OPS-plus in that span was 147, peaking at an absurd 178 in his MVP season of 1997. Now imagine a 26-year-old Harper stepping into that arena. We’re guessing he’s thought about it once or twice. He’d be away from both coasts, in a media market that ranks outside the top 15. So Harper would have to settle for owning an entire time zone. Indeed, a move to Colorado wouldn’t be terrible for his brand: The games start earlier than those on the West Coast, ensuring his exploits would get some exposure before much of the nation nods off. Rockies fans roll deep when the product is even halfway decent, and their second consecutive playoff berth resulted in 3 million fans at Coors Field, for the first time since 2001. Denver is less than a two-hour flight from his hometown of Las Vegas and, should this be of import to he and his wife, in an area of the country with a significant Mormon population. 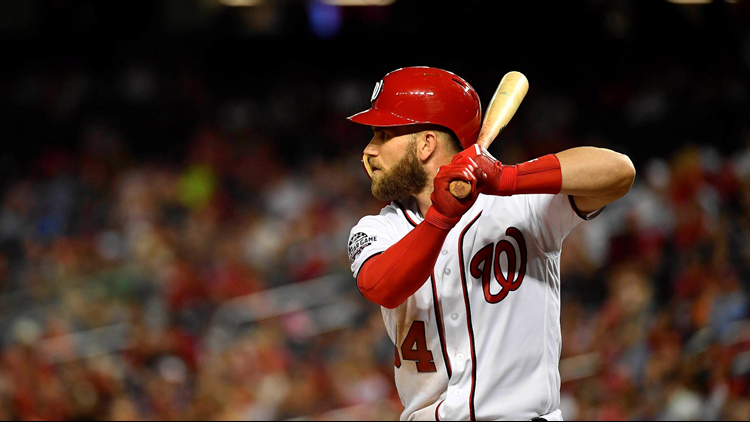 Washington Nationals center fielder Bryce Harper at bat against the Philadelphia Phillies during the third inning at Nationals Parkon on Aug 22, 2018. With a franchise value of $1.1 billion and annual revenue estimated at $266 million, according to Forbes, the Rockies have the wherewithal to pay Harper. Those numbers should both rise based on the enhanced attendance figures from 2018 and the Rockies’ winning the right to develop and lease land directly south of the ballpark. While baseball economics are far from a zero-sum game, it would indeed be challenging for the Rockies to secure long-term deals for Harper and Arenado in consecutive off-seasons. That could lessen the upside of Harper’s addition should it eventually sever fans’ connections with Arenado, who has finished fifth, fourth and third in MVP voting the past three seasons. However, Arenado will turn 29 – three years older than Harper – as he begins what would be the first year of a long-term deal. For now, Blackmon remains the lone significant commitment beyond 2021. Signing Harper – for say, 12 years and $420 million – would require some creative financing in the early years, but shouldn’t be injurious in the long run. Possibly. The Rockies should recognize that their window to win may never be better, given their offensive core and that rarest of sights in Denver – young, capable starting pitching. With the status of one franchise player in doubt, locking down another in the near term would ensure them enduring relevance – along with a powerful shot to win it all now.